The striking daughter of Mastercraftsman, Flavigny (pictured), produced a dominant galloping display at Tauherenikau on Monday when taking out the Listed Wairarapa Breeders Stakes over 1600m for fillies and mares at Weight-for-age level. Ridden by international jockey Mark du Plessis, Flavigny travelled sweetly throughout the running, just behind midfield with cover, before du Plessis edged her into the open at the top of the straight and produced a barnstorming run down the outside – swamping her rivals and touching down for a comfortable victory. Co-bred, in partnership with Graham and Helen Bax, and raced by Windsor Park Stud, Flavigny has always shown well above average ability, although issues off the track have prevented her from realising her full potential, although the black-type victory has now made her a real exciting racing and breeding proposition. 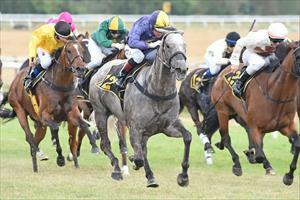 “We thought we were unlucky not to get black-type at Wellington,” co-trainer Chad Ormsby said. No concrete plans have been made for Flavigny and the following days will be significant as to what path Mike and Chad elect for the new stakes winner. The Ballymore team are enjoying a great run of late having produced five runners in the past five days and this looks set to continue with several other exciting runners to step out over the coming weeks.